In July, Chattanoogans turned out in force for GIGTANK Demo Day, the concluding celebration of The Company Lab’s gig-focused summer accelerator program. With 900+ in attendance, GIGTANK Demo Day is Chattanooga’s premier technology event, serving in equal parts as an annual benchmark for how far we’ve come as a technology hub and as a launching pad for future successes. 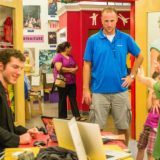 Building an App from the Ground Up | The Creative Discovery Museum and Spartan Systems, Inc.: An application-creation toolbox and digital record co-designed by teens and developers that will serve as a design blueprint for other youth-serving organizations in Chattanooga and beyond. Gig Demo Calls: On the first Friday of each month, Hive CHA joins forces with Hive Kansas City to host a Google Hangouts on Air call about the newest innovations in next-generation networking, software-defined networking and gig-fueled educational endeavors. Now in its third month, the Gig Demo Call has featured six unique demos from gig experts, which have reached an audience of over 250 viewers across the globe.